Founded in 1970, our law firm is the oldest legal services provider in the area. Through our long history, we have earned the respect of the residents throughout our community. In addition to handling cases for both private individuals and businesses, our firm also represents the Polk County government, and we have established long-standing relationships with our clients. Our attorneys have considerable experience with trial law and are proud of their long record of achieving successful results. Using a client-centric approach, we handle each client's case individually to ensure we provide the best possible legal counsel for our client's specific situation. When dealing with personal injury cases, including vehicle accidents and premises liability claims, we aggressively seek the maximum amount of compensation while protecting our clients' rights. Likewise, we fight hard for those injured on the job to ensure they receive the benefits to which they are entitled. Those facing criminal charges can rely on our law firm for solid, effective defense strategies, and we can represent those who need counsel regarding civil litigation. Additionally, families throughout the region have turned to us for help with domestic relations issues. 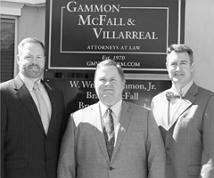 No matter the legal need our clients have within one of our practice areas, the attorneys at Gammon, McFall & Villarreal have a solution. We offer free initial consultations as an added measure of convenience.